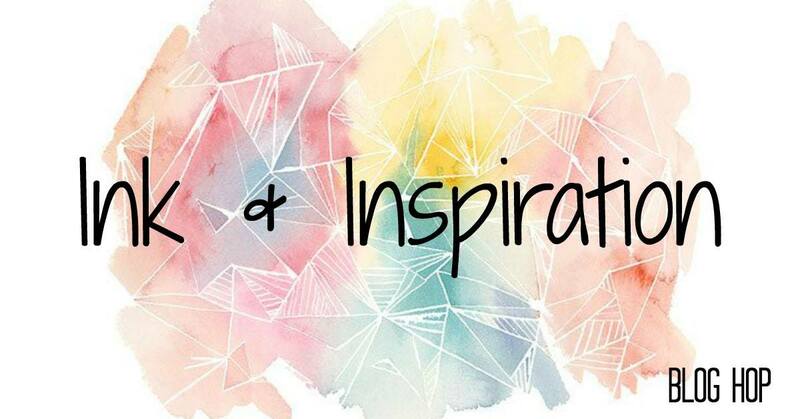 Welcome to this months Ink & Inspiration blog hop. This month's theme is Easter or seasonal. You are currently visiting Rosalie Desmond from Australia. 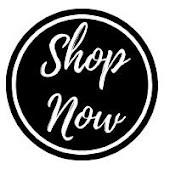 Be sure to continue on with the blog hop by using the list further down the page. This month I have an Easter card for you. 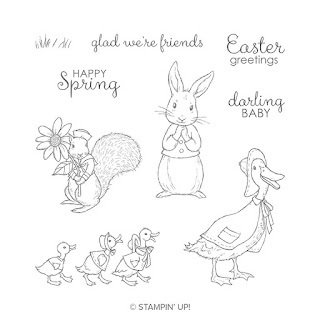 I rarely make Easter cards, but I just couldn't resist creating one with the Fable Friends stamp set and using the cute little rabbit. 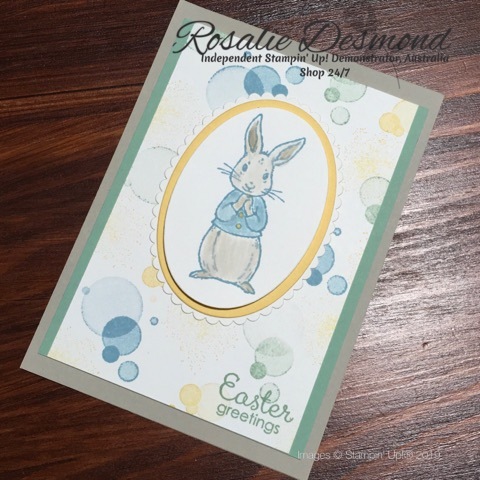 The background was made using the bokeh spots from the Beauty Abounds stamp set. 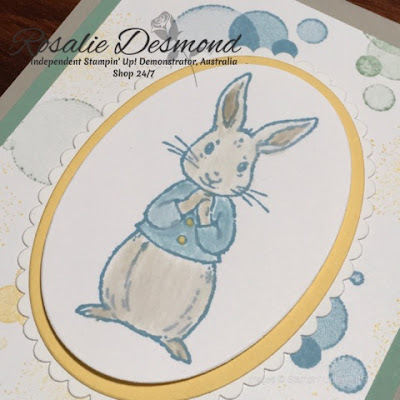 I then layered the rabbit using the oval framelits to give the card a little dimension. 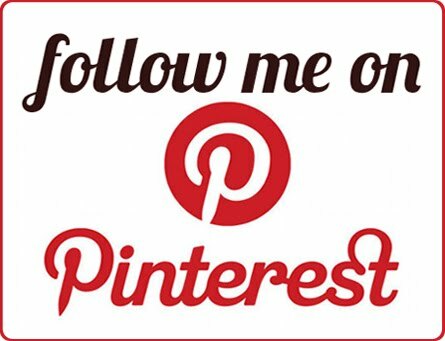 I hope you enjoy the remainder of the blog hop. 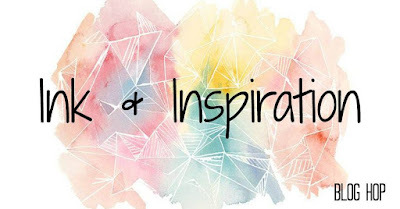 Welcome to this months Ink & Inspiration blog hop. This month's theme is Technique Savvy. This month we are focusing on different techniques. Techniques can be a wonderful way of adding some fun to your projects. On todays project I have used two different techniques. The first technique is the watermark technique. 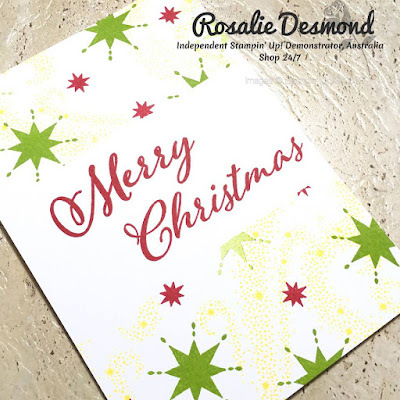 This technique is very quick and easy by stamping using versamark ink. It gives a subtle image which is not overpowering, yet adds to the project. The second technique is distressing. On this project I have distressed the card stock in a number of ways. I used the edge of scissors to scrape the edge of the card and then I sponged colour to make these edges stand out even further. The main image on the card I futher distressed by screwing up the card stock after I had stamped the image. Check out my video if you would like to see further details on how this project was created. Welcome to the second Christmas Stampathon for 2019. 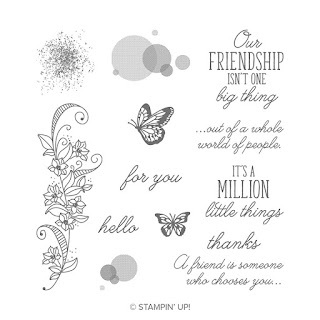 We love to make the most of our stamp sets, after all that's what we buy them. 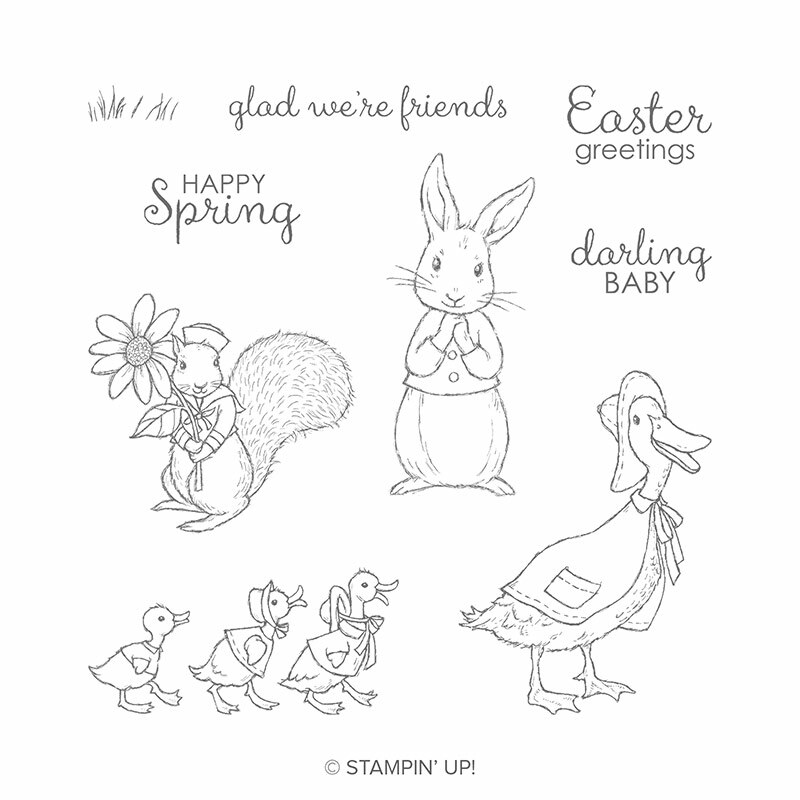 One fun way of using your stamps is to create a fun background for your projects. So in that spirit, we bring you this months theme of "stamp a background". Using the Star of Light stamp set I have created these 4 fun fold cards. I have used images from this set on Whisper White card to create a background and used it the same way we would Designer Series Paper. I made these cards a little different by cutting the card stock on the diagonal. For more details on how to create this fold, take a look at my YouTube video. The die cut star is from the Starlight thinlits, which I have then added some sparkle with the clear Wink of Stella brush. 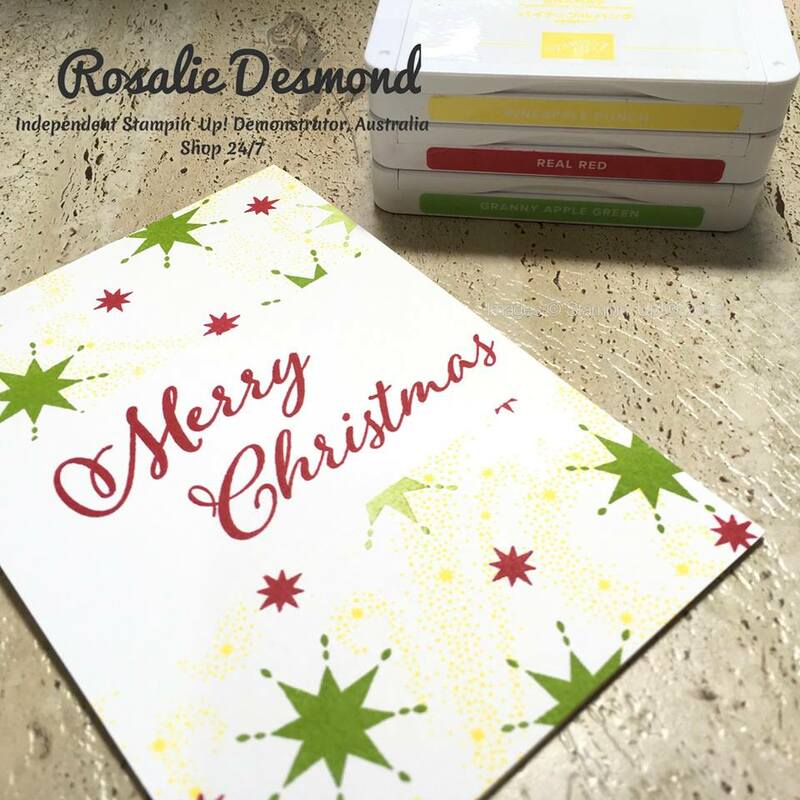 The Christmas Stampathon is a collaboration between four international Stampin' Up! demonstrator friends. Ruth Trice from the UK, Denise Garrison from the US, Ellen Woodbridge and myself, Rosalie Desmond from Australia. 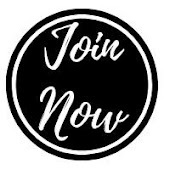 The challenge is set on the 25th of each month (January- October) and entries are accepted until11pm on the 24th of the following month, either via the group Face Book page or directly to one of the demonstrators. Everyone is welcome to join the challenge. I hope you choose to join us this month. I can't wait to see all the amazing projects. Welcome to the first Christmas Stampathon for 2019. Frugal crafting means keeping the cost of the project low. This can be done in a variety of ways including recycling, up-cycling, using scraps or keeping product use to a minimum. For my project this month, I choose the last option of using very little supplies to create my cards. To create the card I used a masking technique with a sticky note to provide some white space on the card front for the sentiment. It is amazing what you can achieve by simply using stamp, inks and paper. To see just how easy these cards are to make, take a look at the video. 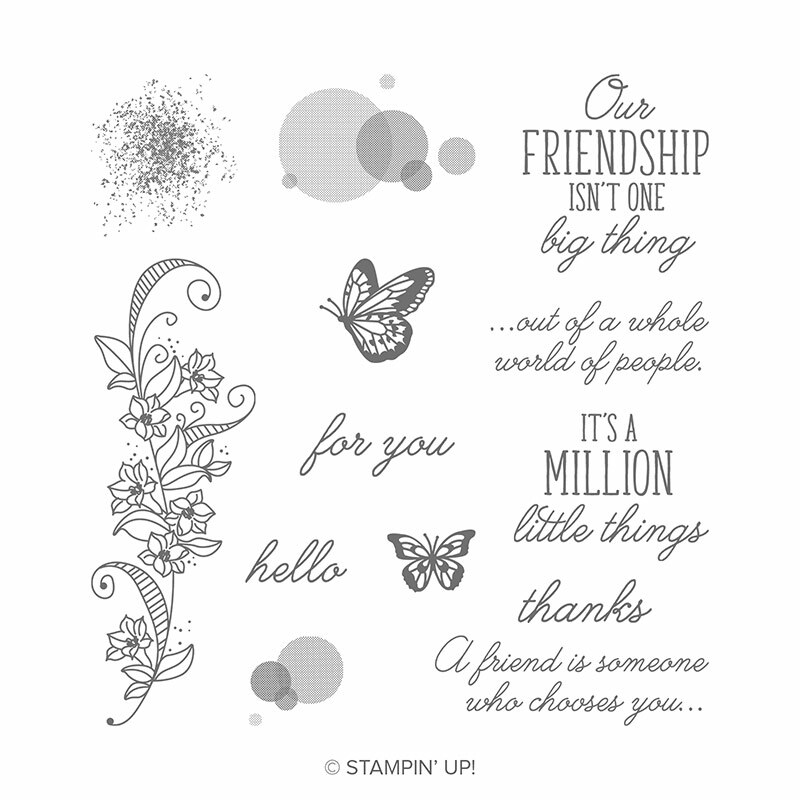 The Christmas Stampathon 2019 is a collaboration between four international Stampin' Up! demonstrator friends. Ruth Trice from the UK, Denise Garrison from the US, Ellen Woodbridge and myself, Rosalie Desmond from Australia. 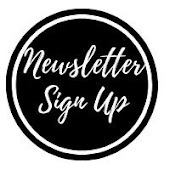 The challenge is set on the 25th of each month (January- October) and entries are accepted until 11pm on the 24th of the following month, either via the group Face Book page or directly to one of the demonstrators. Everyone is welcome to join the challenge. Welcome to this months Ink & Inspiration blog hop. This month's theme is Love Is In The Air. 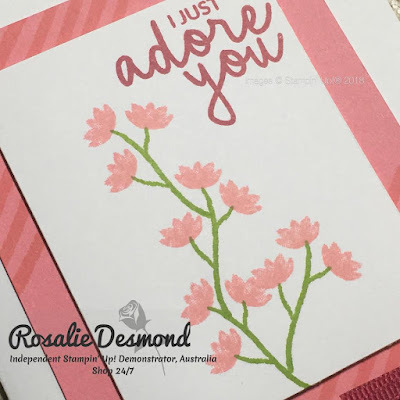 This month I have created a love inspiration card using the Incredible Like You stamp set from the new 2019 Occasions Catalogue. 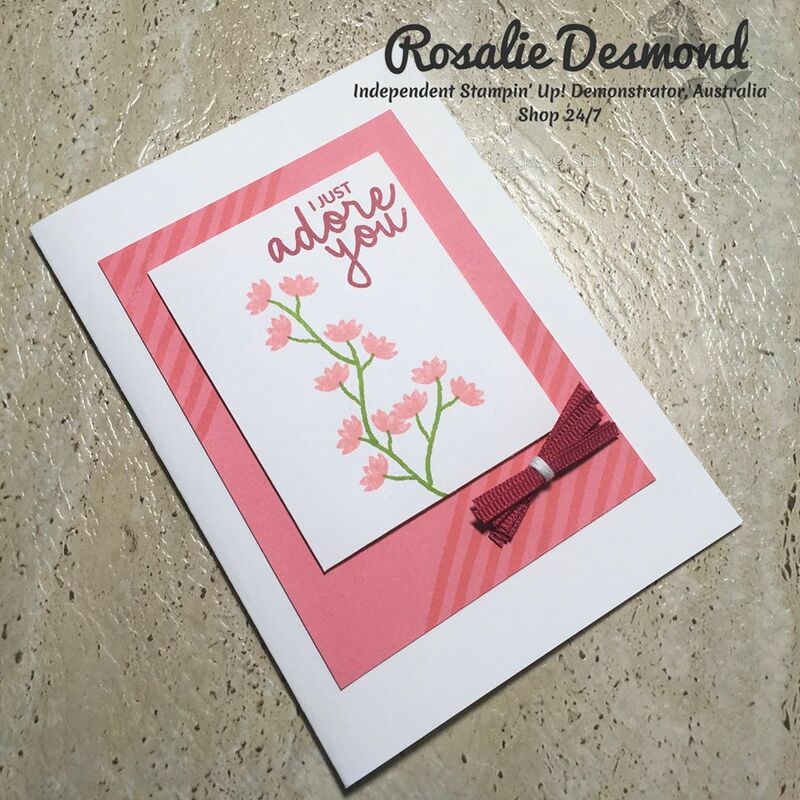 To recreate this card you will need a 21cm x 14.9cm thick whisper white cardstock, 8.5cm x 11.5cm Flirty Flamingo and 8.5cm x 6.5cm piece of whisper white. 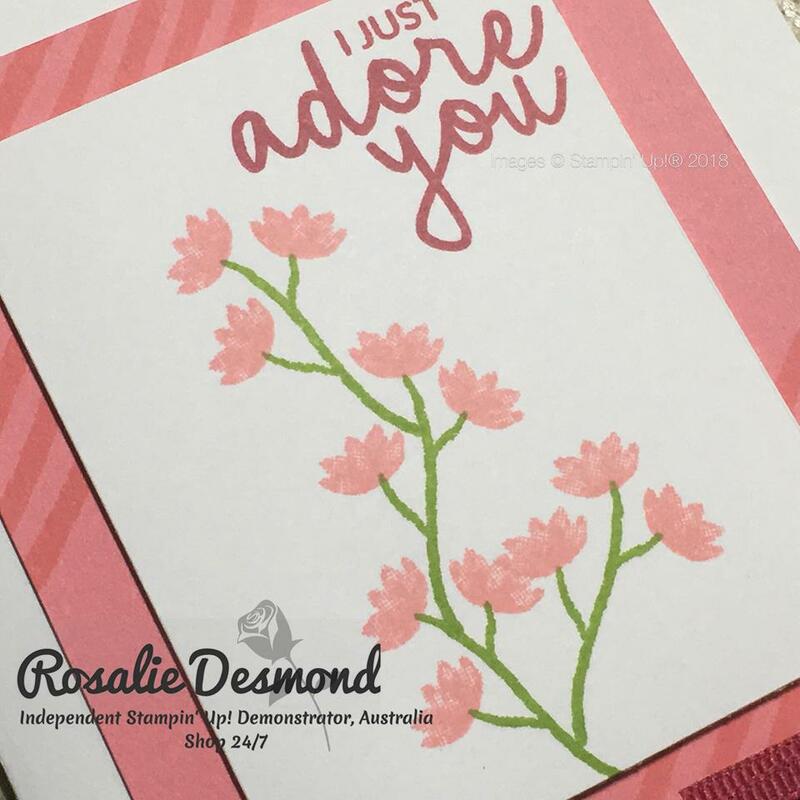 The card uses Lovely Lipstick, Granny Apple Green and Flirty Flamingo inks, in conjunction with the Incredible Like You stamp set. 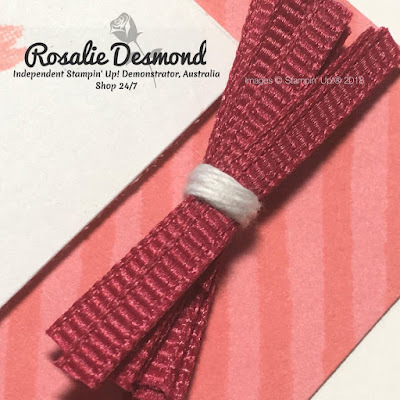 To create the ribbon embellishment I used Lovely Lipstick 1/8 inch grosgrain ribbon wrapped it around my fingers and bound it with whisper white twine and then cut the looped ends to form strips. This embellishment was then attached to the card by sticky dots. 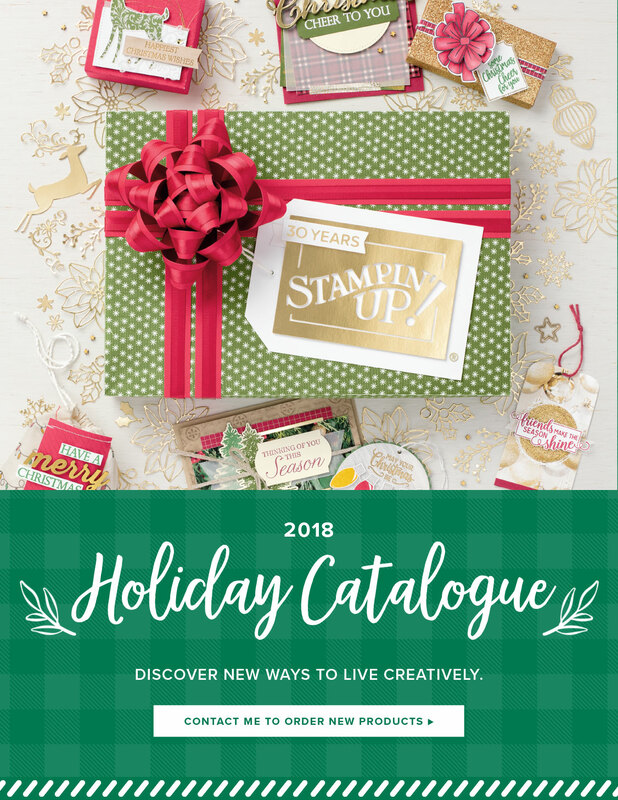 Labels: 2019 Occasions Catalogue, Card making, DIY Card, Incredible Like You, Ink & Inspiration, papercraft, ribbon, Stampin' Up! Sometimes we need to make quick and simple cards but we still want them to look special, which is were the gold foil-edged cards & envelopes come in handy. 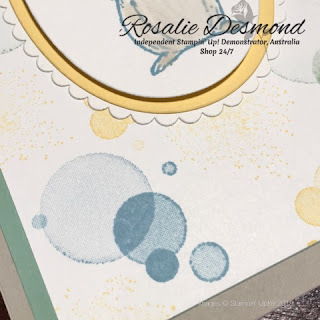 This card is quick and easy to make using a little designer series paper and some gold embossed stamped images. The berries have been coloured in with the real red Stampin' Write maker to create bold coloured berries which give a lovely contrast to the gold embossing. To see how I made the card, check out the video below. 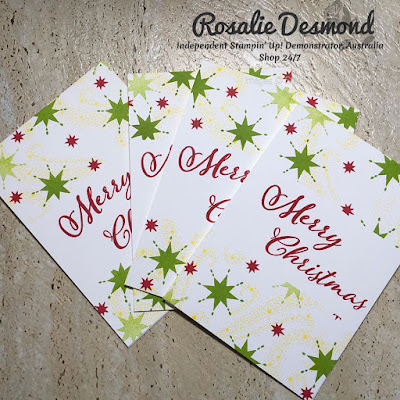 In no time, you will have yourself a handful of cards to give to friends and family. Thought I would share some pictures from the Christmas crafting day I had on the weekend. Someone did forget to take pictures throughout the day, so I just have the before pictures to share with you. Over the next couple of weeks I will share some of the projects in more detail with you. When I run a full day class I like to have all the items needed and the sample project in the one basket, so an attendee can just grab the basket. sit at their seat and where possible not have to hunt for the correct colour ink or stamp set. Sometimes there is a little cross over, where two projects use the same punch or set but I do try to keep this to a minimum. I like to provide my participants with a bag which includes a little surprise inside (this time is was some 6"x6" samples of DSP) and a small table gift. The bag comes in handy later to store all of their projects, making it easy to take home. At my day long events, I also have a door prize. The name of all people in attendance are placed into a bowl and a winner is chosen at random. This was the prize for this event.